As with a good friend, we expect our customers to let us know what’s on their minds. If you have any comments, questions or suggestions, please feel free to contact us. We’d love to hear from you! We’d like to keep you posted on what’s going on at Cloer Family Vineyards. We promise only to send updates regarding new wines and events and will not give your contact information to any other parties. If you’d like to hear from us, please submit the information below. "We always enjoy coming to Cloer for the many fun things to do as well as the wonderful local wine. It "feels" like family. We enjoy the beautiful grounds, sitting by the firepit, the talented local music. My daughter and I love the Yoga nights for several reasons. Yoga is a mind/body connection. Meditation also comes easy in the setting of what you have to offer on your beautiful serene property. The wine tasting after is always a icing on the cake!" "There was no better spot than to have our anniversary party at Cloer Family Vineyards. Pam and Tam were so helpful from the initial planning to the end of the night. Being outside that evening drinking wine had a magical feel. Our friends still talk about what a great party it was!" "The Cloer Family Vineyard is a fantastic winery. The wines are delicious with a taste different from other North Carolina wines. The country setting is beautiful and so peaceful, set right in Apex. The Cloer family is very friendly and welcoming. A great afternoon or evening getaway with good friends and great wine. " "Your driveway led us to escape from our every day routine to a blissful, calm, and serenity filled haven. So beautiful.... We are thoroughly enjoying our wine purchases and busily singing your praises." "The Cloer's Carlos is my favorite! I am a big fan of the sweet German Mosel wines and Carlos reminds me of those, but with a North Carolina twist." "I enjoy the flavor of Veranda so much that I have shared it with my family and friends and give it as a thank you gift to my clients." "I loved the Cloer Vineyards, an awesome place to go for a picnic lunch and enjoy some fantastic wine! You feel like you are far away from the city, but it's close. It's very romantic, you can relax outdoors and see the vines. We also enjoyed the tasting and fantastic tour of the winery." "We visited Cloer Vineyards for the first time Saturday, February 2, and it was a great experience. Tam was full of information! We have a hobby of visiting NC wineries and have visited approximately 40 of them. 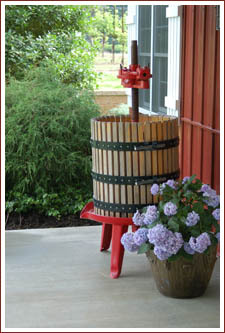 We love to hear the stories of how they got started and about their wine making process. Tam certainly didn't disappoint us! We discovered that since we are from Fuquay-Varina that we know some of his family. He took the time to share lots of information about each wine he poured during out tasting even as several other folks began coming in. He had time for everyone and was extremely cordial. We left with a case of wine that included at least 1 bottle of everything we tasted. We can't say that about all the other wineries we have visited. Since we own a family business ourselves, we try to patronize local small businesses and are very happy that Cloer Vineyards is close enough by us that we can visit often." We now have a Facebook page, so please "friend us" and "like us"!